The theme I picked for this year's VBS is Lonely, but not Alone. Loneliness is a feeling. It's an emotion. It's sadness that comes from being separated from other people. Maybe even separation from our people. But, being alone-that's different. It's much worse, actually. Alone is a state of being. It is being without anyone or anything else. It's the difference of being sad because someone is not with you, or completely without someone to be with you. I don't know why this is the idea I had when I prayed about a theme early this spring. Maybe life subtly prompted this line of thought (through the difficult transition of finding a new church), but whatever the case, it nestled itself in my heart. Because it works. For kids and adults. Who of us has never felt lonely and all alone against the world? Who of us have never felt alone as we've stood up for what we believe in? Who of us have never felt alone as we did the right thing-all by ourselves? Who of us have never felt alone in new, unfamiliar places? Who of us have never been tempted to compromise our deep held beliefs just a wee bit (or a great big bit), in order to have a friend? Not many can answer "me" to many of those questions. As I prayed, God laid on my hearts of the stories of Shadrach, Meshach and Abednego. The story of Daniel. The story of Elijah. The story of Balaam. The story of Jesus Christ. Shadrach, Meshach and Abednego were awfully lonely as they literally stood up for what they believed in. Yet, God was with them-in the fiery furnace. Daniel must have felt rather lonely as He chose over and over again to do the right thing. He started with the small choice of resolving in his heart to not defile himself by eating the king's food. He got to the end of his life, over 70 years later, and choose to do the big right thing-openly praying to God, as his habit was, even though the consequence was certain death. He started young, he built a habit of doing the right thing, and it started in his heart. Thus in the lonely periods of his life, he was not dismayed or fearful. He knew God was with him. He was never alone. He was never without help. Elijah. That poor guy! How lonely it must have felt as he spoke God's message, and then moved from place to place. A remote brook. A foreign city. Another back home where God's people rejected God. On to Sinai. So lonely. Yet, not alone. God was there with him. In those countries. By that river. On those mountains. In that cave. Not as the fire, or the wind, or the earthquake. But, as the still, small voice. God was with him, taking care of him, when it felt like it was costing him everything. The Lord was with him everywhere he went. Balaam, well he serves as a warning to us. When we let discontent seep into our hearts. When we forget that God is with us, and that is enough. When we set a price tag. When we compromise our beliefs. God's presence in our lives in much more important that a house filled with silver, or all the prestige money can buy. He is the only one who was ever truly alone. God left him all alone for 3 hours while Christ was on the cross. My God, My God, why have you forsaken Me? So, He could bear our sins and their awful punishment. Including separation from God. 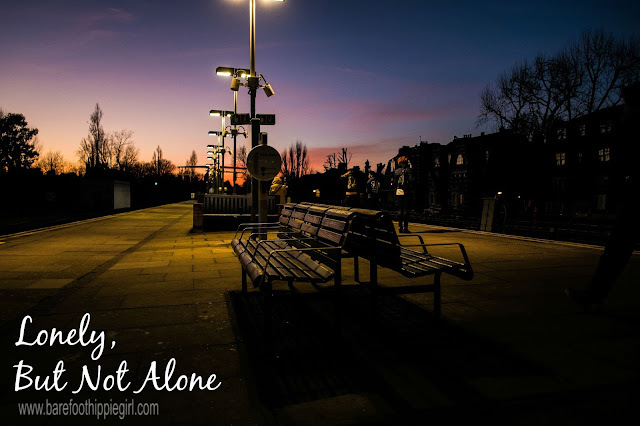 Jesus Christ was alone so that believers will never have to be. That's the crux of the matter. Sometimes lonely, but never alone. She Plans Dinner Back to School Sale!!! Now through September 15, save 50% on any subscription using the code BacktoSchool.